As usual we have a lot to cram into one journal entry! Over the past two weeks we have travelled through humid rain forests, arid mountains, high plains and over chilly mountain passes... The scenery has been beyond incredible... Just take the photo above, we got to cruise down that road! And the people, we seem to make friends just about every time we stop our bikes...and even when we don't for that matter! Colombians are among the nicest people that we have met, and have made this leg of our trip wonderful! First, here are some photos to feast your eyes on! We parted ways with our friend Niels in Buenaventura, as he hopped on a bus to take him to Quito and we pedalled towards the nearby town of San Cipriano. Leaving Buenaventura was hot, dusty and not the most pleasant cycling experience we have had. The city sprawls out for 10 or 15 km,and the poverty is heart wrenching, we would soon see that Buenaventura is a stark contrast to other cities in Colombia, whose centres are clean and whose population is, for the most part, much wealthier. We would also learn that many Colombians hold disdain for Buenaventura, and sort of shutter at the mention of it. When we asked why this city was so neglected, people would usually shrug. Of course, the importance of this city to drug trafficking is well known, as is the historic presence of the FARC, but this is not mentioned. The village of San Cipriano turned out to be just as awesome as the trolley ride. With a river that had the clearest water either of us had every seen, many hikes, and an entertaining (albeit out of control) gang of local kids, we decided to stay a second day. We had also met a super nice group from the Cali area, and had ended up with an invitation to stay with Pacho and Angel near the little town of Dagua, which was about half way to Cali! We pulled ourselves away from San Cipriano and got an early trolley back to the road....and then we began to climb. 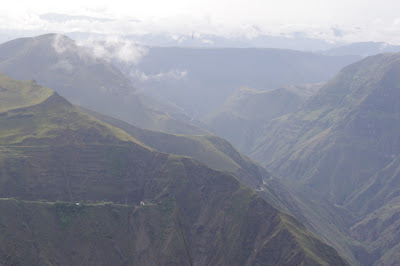 We knew that it was coming, we would be climbing up to 2000 meters over the next two days and then back down to Cali at 1000 m. The scenery got better and better as we entered the mountains, we climbed gently as we followed a river through the valley. For about 50 km there was quite a lot of construction and dust, but this meant that traffic was pretty slow and as we pedalled through six tunnels, the big rigs just putted along behind us. By late afternoon we finally made it to Dagua, and called our new friends Angel and Pacho. Their home, and Pacho's pineapple fields were a few km up, so we carried on... And what a reward it was to stay with Pacho and Angel...possibly two of the kindest people we have met on this entire trip! They welcomed us into their home like we were old friends, the conversation was full as we both practiced our English and Spanish and ate Pacho's excellent dinner. We left in the morning, pulling ourselves away again from a wonderful place...and we tackled the second half of our climb. It was more or less steady climbing for 25 km, with plenty of water and snack breaks... And then we made it to the top! The air was cool...which felt miraculous. We enjoyed the view for a while and then dove down to Cali, the third largest city in Colombia. The ride in to the city was all downhill... So it was fast, and before we knew it we were downtown. We had a stay with a warm showers host, Steve, arranged, but would need to wait a little while longer for him to get home. So we spent the afternoon and evening visiting the art gallery and eating some pizza! There was barely any traffic on the Sunday morning when we made our way out of Cali towards Santander De Quilichao. We saw plenty of our road cycling cousins though, many of them on their way back to the city already. After about 50km of very flat riding, with little to no wind and lots of sun, we found ourselves in Santander in time for lunch. We satisfied our appetites and then made our way to the Central Park to meet our warm showers host John. He and his family were very kind and accommodating, opening their home to us as though we were family. John has been studying English for the past couple of years, and finds having cyclists stay with him an excellent way to practice, we also appreciated the opportunity to practice our Spanish with him. That evening it rained again, quite heavily for a while, and we went to bed early. The next morning we thanked our hosts and headed off to Popayan. No more flat plains, we were now biking though rolling hills. When we finally descended into Popayan it was beginning to rain and we were running out of daylight. We weren't having much luck finding the Central Park so we stopped near another park and found a phone to contact David, the warm showers host we were planning on staying with. He was surprised to hear which neighborhood we were in, as he later told us it was not a very safe one. We then arranged to meet at the Plaza De Torros, which concerned the women with the phone service, as apparently THAT was a dangerous area... Well, we eventually found the spot, after overshooting it by a block and being warned about the dangerous neighborhood to our left. While we waited, we were informed by yet another concerned citizen that the corner we were standing on was dangerous! He advised us to wait in front of the hotel across the street and call our friend again, so we obliged. Next door to the hotel we were offered a seat and free coffee and assured that no, the neighborhood we were in was not dangerous! In the end we made it to David's house without incident, and after cooking dinner went to bed. The next day David showed us around Popayan, which has many nice historical buildings and a beautiful town square, and we also climbed a hill with views of the town and surrounding countryside. David and his brother are artists, and David is studying at the faculty of art at Popayan's University, so we were lucky to also get a tour of this awesome building with student murals covering the walls. For lunch we ate at a restaurant that serves vegetarian versions of Colombian food, and for a very good price - what a treat! When we were tired of walking around town we headed back to the house to rest in preparation for the next days ride. Long long climbs was the theme of this stretch...interspersed with a few incredible downhill runs :) Unfortuantely the morning we left Popayan I was not feeling on top of my game, I had been up part of the night with stomach pains, and the morning brought many visits to the toilet ... Ugh, just when you think that your feeling well. We decided to ride about 20 km to the next town of Timbio and get a cheap hotel where I could rest for the day... The ride was not long, but it was hilly, and I got a flat tire for the first time in months, it was a bad luck morning. But we found a nice place to rest up, change tires, do some laundry etc, and get a good nights sleep. The next morning I was feeling a lot better, and we carried on to the town of El Bordo. The ride became more and more beautiful with mountain vistas in every direction, but these views were not without effort, we climbed and fell and climbed and fell for the entire day, leaving was pretty worn out by the time we reached El Bordo. We asked at the local Bomberos about camping, and they were glad to have us. It was a friendly group, and the son of the fireman who had first greeted us was the friendliest of all. He was very interested in everything we were doing, and explained many things to us about Spanish, and firemen, and how awesome his dad was ... It was a lovely evening. Unfortunately the night did not yield much sleep as the fireman on night duty watched TV very loudly to stay awake, and we certainly were not in a position to ask him to turn it off... But glenn eventually did break down and asked him If he wouldn't mind turning it down. Feeling a little groggy we carried on with a fast ride that was mostly downhill or flat, but by lunch time we were drained and decided to call it a short day, as information about the whereabouts of the next town and how many hills we would have was a little spotty. We ended up hanging out with a group of truckers for the evening, who were stuck in this town until Monday when they would be permitted to take their 'Carga Larga' (large load) on the road again. A very entertaining group... Who drank a lot and where highly inappropriate, but what else would you expect from a group of truckers stuck in a little town for a couple nights. Onwards we travelled towards the city of Pasto which sits at 2600 m, although, we had discovered that climbing up to this place was not a simple matter of going uphill, no this is not how mountain ranges work... There are valleys between that must descended and then climbed back out of. It is also the rainy season, and for the first time in months we have pulled out our rain gear to avoid a soaking or two. All this rain made the ride all the more interesting, with evidence of small landslides a plenty and slippery muddy conditions to negotiate! As we were taking a break on the side of the road to have a little breather from all the climbing and rain we saw another cyclists coming in the distance. It was Nigel from Australia who has spent the last couple years touring the US, and Central America on bike, he is now on his way to Ushuaia as well. We ended up riding with him for the rest of that day and the next day as well. It was great to have some new company on the road, and sure made the hills pass by a little quicker! The night before we arrived in Pasto we had a little trouble finding a camping spot. The closest bomberos were located in the airport, and we would not be allowed in for security reasons...eventually we found a police club, complete with a pool, and they agreed to let us camp their for a small fee. There was a young family taking care of the place and they let us use their kitchen which was great. We had a peaceful and cool night in the tent and were refreshed for the last pull up to Pasto. We rode up to 2800 m before descending a couple hundred down to the city of Pasto. Pasto is a nice unassuming town, and it is, as we have been warned for some time now, chilly! We have dug out our fleeces, scarves and hats from ten bottom of our panniers...and it might sound strange, but it feels good to be cold again! We were welcomed to camp at the Bombero station in the suburb of San Lorenzo, they have even let us stay two nights! It turns out they do have quite a few cyclists stay here and are accustomed to the routine and attuned to what cyclists want and need, they quickly pointed us in the direction of showers, kitchen and laundry area! Thank you!